Create Slides in VoxVote - No need to switch to PowerPoint or Keynote. Discuss the live results with your audience. Try our platform now for free. Unlimited usage! Forget Clickers and SMS voting, use WiFi voting. 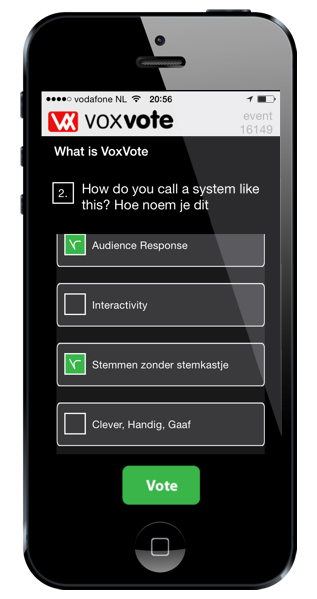 VoxVote free and easy Mobile Voting tool for ANY speaker or teacher. Use VoxVote to interact live with your audience. 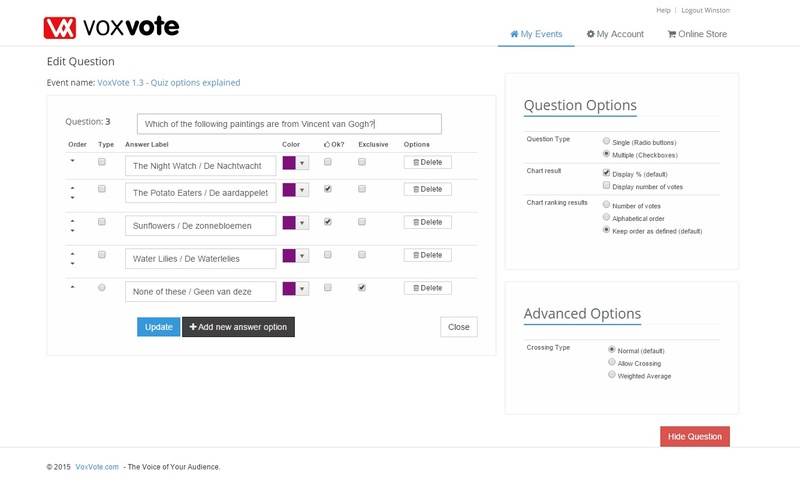 Create questions, ask your audience to vote and discuss the live chart results. Now with question and answer messaging module - Allow your audience to ask questions. Go live within 2 minutes. We've already created the first question for you. You receive 5 events for free (worth 100 euro) and allow UNLIMITED audience voting. Are you in an audience, which could be a classroom, stadium or conference? Received a PIN code from the speaker? Vote on live.voxvote.com in your browser. Testimonial received by mail from Joshua Spicer from Whitman-Hanson school in Massachusetts: "After researching a lot of these services, I didn’t believe your site would be truly “free” like you advertise. Most of your competitors either cap at 10/50/100 votes or have some other hidden restriction. While I feel like you advertised well, your site seemed almost too good to be true. Does that make sense? You have a great free product - I would suggest advertising “NO CAPS”, “NO RESTRICTIONS”, etc more prominently. It took me a lot of searching to find your service, but if I found it earlier I would have stopped immediately. I was going to use ... (another website/product) The website was buggy and on some phones wouldn’t render correctly. Also, it was VERY easy to vote multiple times despite there being an option to turn that off. While some students did find ways to vote more than once on your service, it was much more difficult. You also have a much nicer website/app." Also decide if you want to send the image to the audience voting devices. Available for paying users and granted educational users. See our video tutorial for image questions. A new question type is available. On top of multiple, single, ranked, you can now ask open answers. The reporting is done in a WordCloud (of words) and a frequecy (full answers). Protip: Ask you audience to answer with short answers. VoxVote Quiz functionality is now available. You can mark the correct answers and your audience will score a points total. See how to collect your audience names. Watch the video tutorial or read our VoxQuiz™ frequently asked questions. VoxVote is always free for everybody to try on 5 events. Additional free educational upgrade, with more features and functionality: from June 2014, until the end of 2019, you as a teacher, or other educational user can use VoxVote completly for free. You can read here more about this unique offer. A list of granted domains is listed here. We have already 1500+ educational institutes granted for all staff and teachers. 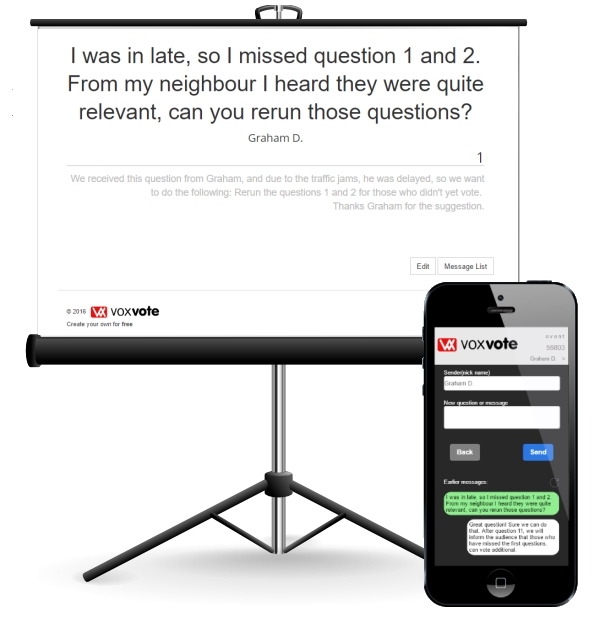 VoxVote is worldwide helping teachers in rehearsal and knowledge transfer. All the functionality you might expect from an Audience Response System is available for free, including some special VoxVote features. Are you looking for a business alternative for Kahoot? You just found us. Same functions, but slick design and less distraction. Vote over internet with your smartphone (WiFi, 3G/4G) browser based. Add image to your questions. Create presentation slides. No need to switch between PowerPoint or Keynote. VoxVote explained in other language? Create/prepare your questions in advance. 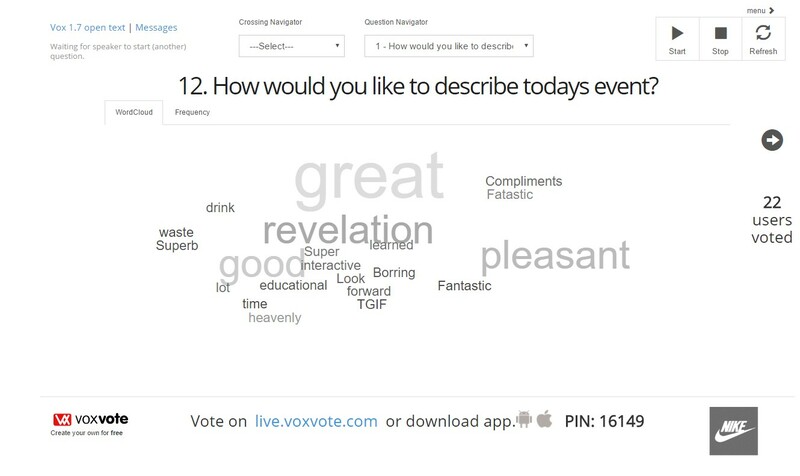 With VoxVote you can preview your questions, vote yourself and see how the graphs will look on the big screen. Laptop, tablet, PC's - anything connected to the internet will work. 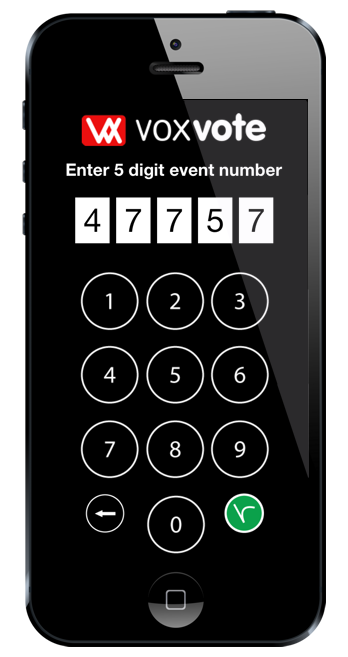 Inform your audience your unique event number (5 digits). They will vote anonymous. Refresh the chart, and discuss the results / interact with the audience. Continue with next questions / add new questions / modify questions. At the end, when closing your event, you can archive your project and share an e-mail summary to the voters who left their email addres after the last question. Why should I use VoxVote? Reduce paper feedback forms (low response rate, lot of work to handle). Allow your audience to ask questions, which can be moderated by you. Read more about these functions. We have many clients in our porfolio, devided in the following main markets. Educational Schools, universities, educational learning. Internal meetings using VoxVote to vote intenal business meetings, during business trips, outdoor (sports) events, or even your school or pub voting contest. Here is a random list of our recent clients. You can click on details to view the case we have described with our client. Want to be listed here? Contact us.